Entrepreneurial storekeepers Chris and Trevor Johnson operate Rapid City's eclectic Clock Shop. 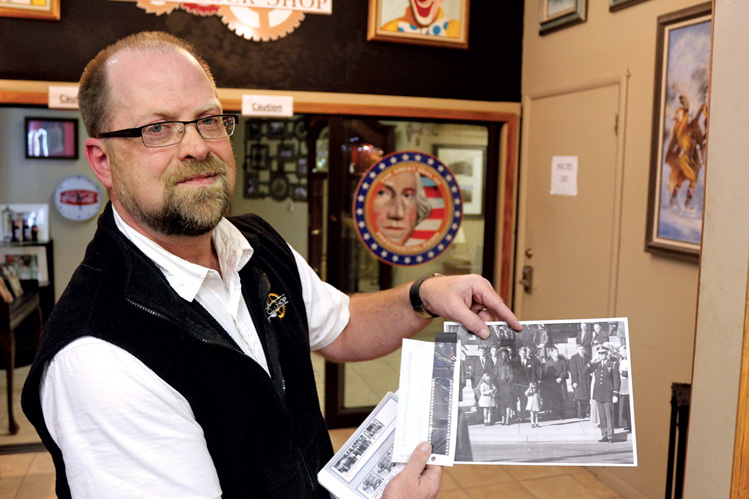 To appreciate the Clock Shop and Presidential Pawn in downtown Rapid City, you need to know about Chris Johnson, who grew up 200 miles to the east in Highmore. The Johnsons weren’t wealthy, and gold was the furthest thing from their minds. Mr. Johnson was a high school history teacher and a carpenter. Mrs. Johnson baked bread for local restaurants, and for her children. 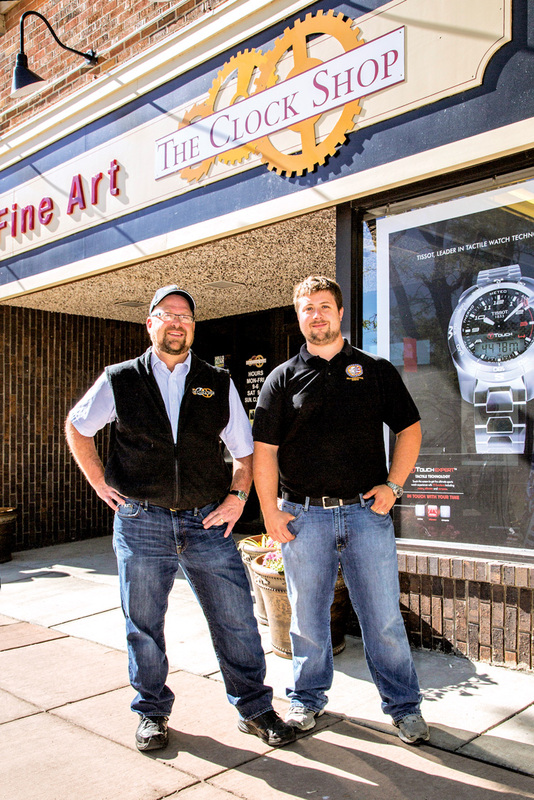 Years later, while working in the mailroom for the Rapid City Journal in the 1980s, Chris helped his in-laws, Tom and Jean Uhrich, start a shop called The Clock Shop, a spin-off to their jewelry store. “There was a large calling for clock repair,” Chris says. “I helped him put it together in the basement of his store across the street from here.” He started working full time for them in 1993 and bought the store eight years later. 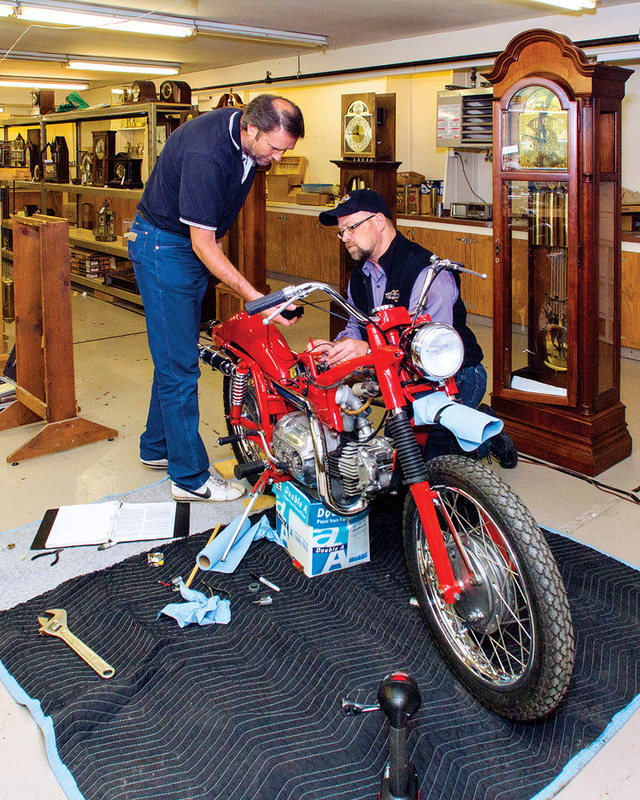 Chris Johnson and David Peck, the shop's clock repairman, have dealt with a wide variety of merchandise, including a rare 1964 Harley Sprint motorcycle. But the Johnson family pawnshop, at 610 Seventh St., in Rapid City’s bustling downtown, is different. Customers are often offered a free book on how to escape debt. “We feel that every day there is something important happening here,” Chris says. As many as 400 people visit the store daily, and the Johnsons now buy and sell $5 million a year in gold and silver bullion. Chris Johnson's collection includes original negatives from President John F. Kennedy's funeral in 1963. The photographer's girlfriend brought them to the shop in 1982. Then Chris shows us a miniature dog preserved by a taxidermist that might have been the smallest dog in the world. And a Salvadore Dali drawing. And the Icebox Nugget, thought to be the largest undisputed placer gold nugget from the Black Hills in existence. Chris’ brother Ron, who also works at the shop, goes to the vault and brings back a plain manila envelope. Inside are 190 35mm negatives shot by photographer Robert Tobin at President John F. Kennedy’s funeral in 1963. “You see John John saluting,” Chris says. “Look at this negative. We believe it to be the original of the photograph published in Life.” But most of the pictures have never been published. Tobin was murdered in 1982. The Rapid City woman who brought the negatives to the Johnsons identified herself as the photographer’s girlfriend. “You just really don’t know what’s going to come into this store,” he says. But one thing is predictable: at the top of the hour, the Clock Shop resonates with melodious gongs, chimes and cuckoos from the clocks. It is a wonderland of warm sounds, perhaps as comforting as was Mrs. Johnson’s bread, baking in the oven at Highmore many years ago.